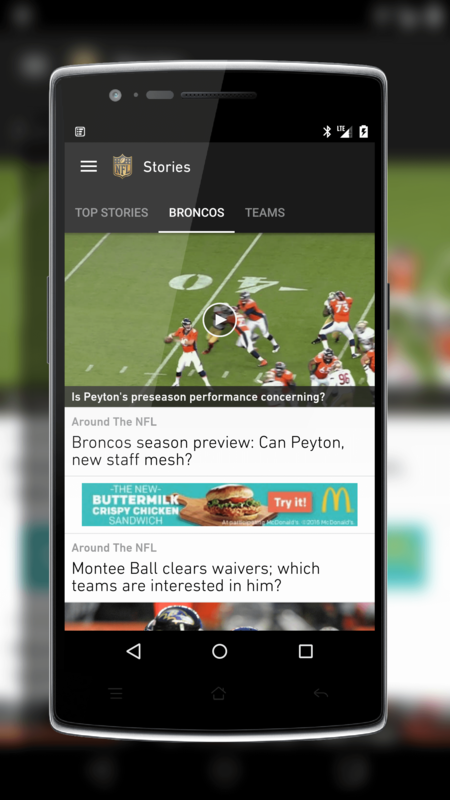 With the 2015 National Football League (NFL) season kicking off in a few days, the NFL has updated their NFL Mobile app for Android with several improvements for the 2015 season. In addition to getting you ready for all the stats, news and information about the league or your favorite team, the NFL Mobile app also has improved video playing and improved navigation. The update is version 12.0.66 for those keeping score at home and it is available now in the Google Play Store. When it comes to video playing inside the NFL Mobile app, the big change is that you can now play videos inline. Previously the app would drop you into a video player after you clicked a link to a video. Now you can watch the videos from within the story list, not having to navigate away. It should make a much better experience for those wanting to catch the news highlights or game highlights. Second, the navigation in the app has been improved which should make finding your favorite content quicker and easier according to the release notes. This is part of the overall design tweaks that have gone into the NFL Mobile app to give it a better look and feel. The app is free to download and you can indicate your favorite teams within the app to get to that content easier and quicker. There are in-app purchases available for additional content at $1.99 per month. Also, if you are a Verizon customer in the United States, you will have additional content as a customer.